Starring Shirley Temple, Cesar Romero, Anita Louise and Arthur Treacher, directed by Walter Lang, based on the novel by Francis Burnett. This was screen uberlegend Shirley Temple’s first Technicolor feature and a huge hit for her in what ended up being her last year as arguably the biggest star in Hollywood. This version doesn’t really resemble the book all that much, but it does feature Temple in the titular role as a young girl left at a boarding school while her dashing father goes off to war. This film is a perfect showcase of the child star to end all child stars at her peak. There will likely never again be a child star who transfixes audiences the way Temple did, and probably none to ever get a drink named after them. Particularly when you consider ordering “a Justin Bieber” will get you thrown out of most bars. 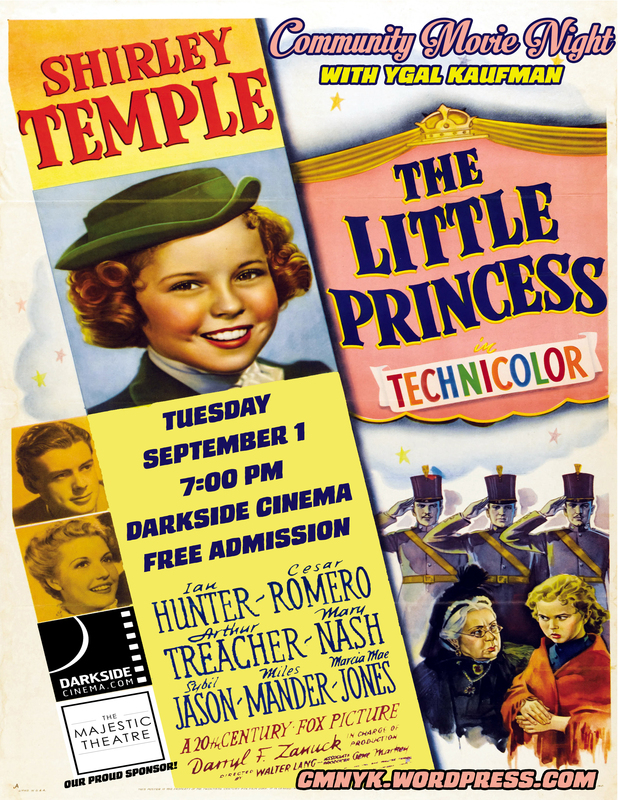 This CMNYK event is going down at the Darkside Cinema on Tuesday, September 1st, and the fun starts at 7:00 PM. As always, admission is FREE, but donations are welcomed and benefit the Darkside Cinema renovations. The show will be preceded by an intro from CMNYK curator and guy who loves roller coasters, but almost always throws up on them, Ygal Kaufman, as well as newsreels, shorts, cartoons and other vintage goodies from 1939 to make the experience extra authentic. This is a very kid-friendly screening, and it features one of the greatest stars of all time, so showing up early might be a good idea. We’ve been standing room only for the last month and a half, and that was without the help of Miss Temple. See you all there! Don’t forget to stop by our sponsor, The Majestic Theatre, for all their great programming, and our host the Darkside Cinema for all their other great movies. Father Brown (aka The Detective, 1954) starring Alec Guinness and Peter Finch, directed by Robert Hamer, based on the stories of G.K. Chesterton. CMNYK is really dusting off the star-power for this one. Let’s see: two acting legends Guinness (Bridge on the River Kwai, Star Wars, Dr. Zhivago, Lawrence of Arabia) and Finch (Network, Flight of the Phoenix, Far from the Madding Crowd) go head to head in a delightfully poppy comic mystery, based on the stories of one of the 20th century’s sharpest wits, Chesterton, and directed by the great Robert Hamer (Kind Hearts and Coronets). In short, if you miss this one, you’ll hate yourself. 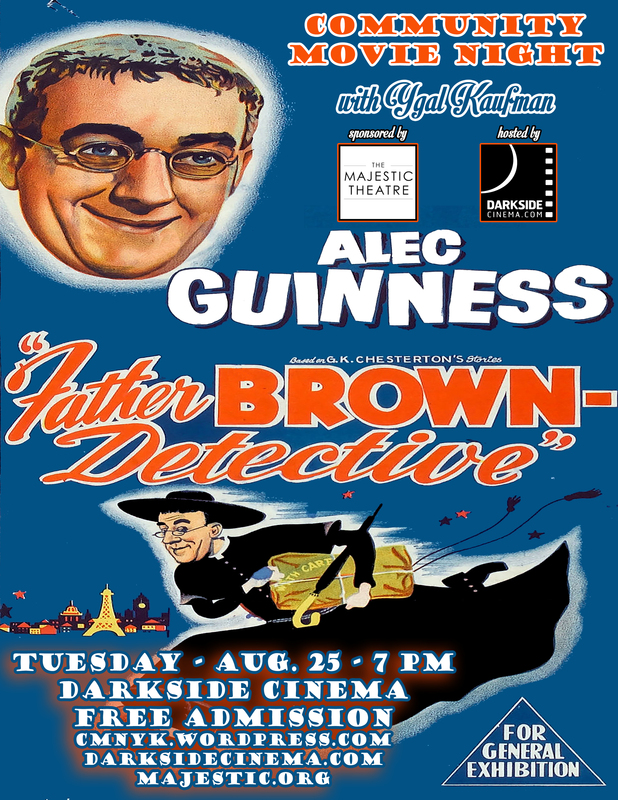 Guinness is the titular Father Brown, a reserved padre and amateur detective who sleuths it up in the far corners of the United Kingdom for the glory of god and justice… and good humor. This CMNYK event is going down at the Darkside Cinema on Tuesday, August 25th, and the fun starts at 7:00 PM. As always, admission is FREE, but donations are welcomed and benefit the Darkside Cinema renovations. The show will be preceded by an intro from CMNYK curator and person who loves a nice filet of sole sauteed with some asparagus, Ygal Kaufman, as well as newsreels, shorts, cartoons, commercials and other vintage goodies from 1954 to make the experience extra authentic. See you all there! Make sure to stop by our sponsor, The Majestic Theatre, for all their great programming. 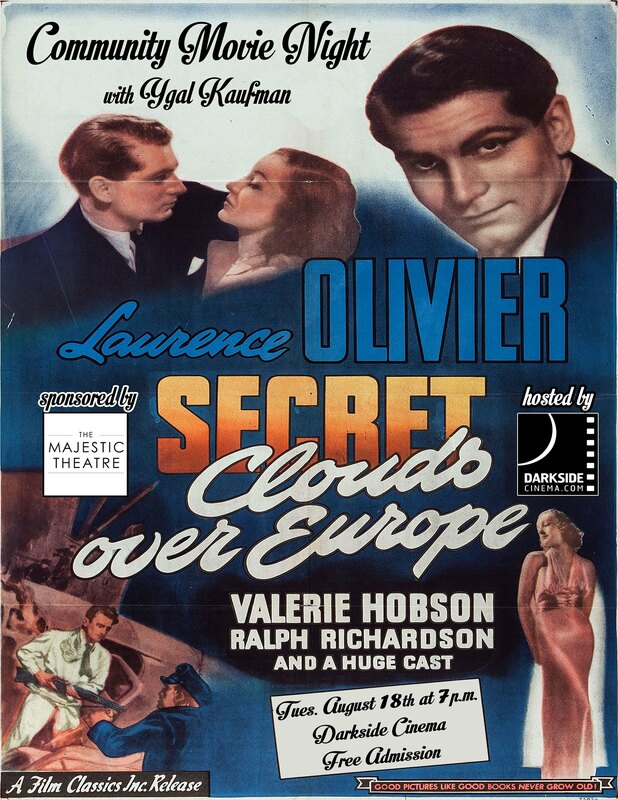 Starring Laurence Olivier, Valerie Hobson and Ralph Richardson, produced by Alexander Korda, directed by Tim Whelan and Arthur B. Woods. This wartime classic is of a nearly forgotten genre that melds political drama, spy thriller and romantic comedy into one unique and amazing picture. We’ve previously seen the great Valerie Hobson at CMNYK in another great Alexander Korda production, The Spy in Black. This is Olivier’s 4th CMNYK appearance, and it marks our very first screening to feature legendary British actor Ralph Richardson. This CMNYK event is going down at the Darkside Cinema on Tuesday, August 18th, and the fun starts at 7:00 PM. As always, admission is FREE, but donations are welcomed and benefit the Darkside Cinema renovations. The show will be preceded by an intro from CMNYK curator and person who knows how to play the theme song from Gunsmoke on a tin flute, Ygal Kaufman, as well as newsreels, shorts, cartoons and other vintage goodies from 1939 to make the experience extra authentic. See you all there!